By now, usage caps on both fixed and wireless networks have grown increasingly common. And while broadband carriers are endlessly looking toward caps and zero rating for a competitive and financial advantage, overlooked is the fact that a huge amount of a user's monthly bandwidth allotment is now being eroded by good old advertising. How much? According to a new study by Enders Analysis, anywhere from 18% to 79% of your monthly data bucket can go toward delivering advertising. Previous studies had pegged this between 10% and 50%. Entry-level mobile data plans start at around 500MB/month — which Enders says could be used to load the text of the King James Bible around 100 times. So "resource-hungry" advertising could clearly become a concern for some users. 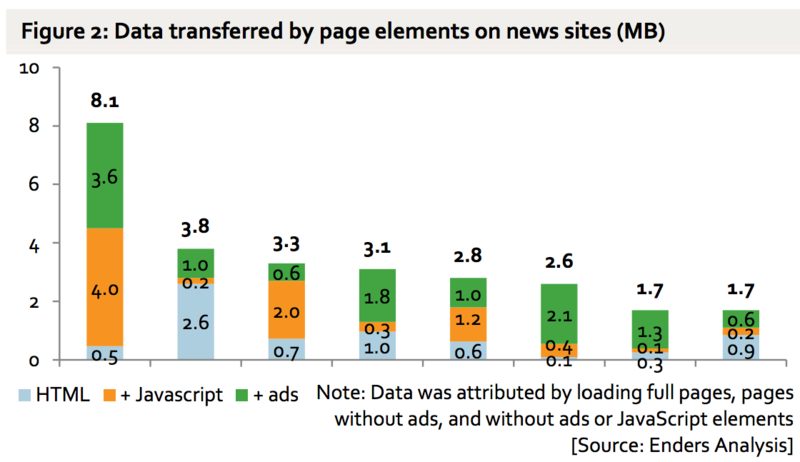 That's not to mention that ads can increase page-load time, Enders adds. It's important to remember this as websites begin waging all out war on ad blockers. Users aren't just using ad blockers because they think it's fun to generate industry histrionics about the end of publishing and journalism as we know it. Users are using ad blockers to protect themselves from annoying malware and poorly-designed advertising and web formatting. They're also using ad blockers to help protect their wallet from broadband provider overage fees. Block the blockers, and you're blocking an effective consumer technology tool. You also have to keep in mind that usage caps (especially on fixed line networks) are entirely arbitrary constructs, not tied to any real-world costs or engineering necessity. And while carriers have worked tirelessly to zero rate their own content or content from the biggest companies on the Internet, so far nobody's rushing to cut consumers a little slack and zero rate advertising at any meaningful scale. In other words, not only are consumers paying an arm and a leg for mobile data, they're paying an arm and a leg predominately so they can be marketed to. When these consumers turned to ad blockers to reduce costs, websites like GQ, Wired, Forbes, and the New York Times decided the best course of action was to accuse these ungrateful bastards of selfishly trying to demolish online content creation. Wired was in such a rush it designed a miserable adblock blocker that's still blocking users that don't use adblockers (or in my case have whitelisted the site). It's just one more reason why adblocker blocking is a lazy "solution" to a misunderstood problem. Don't want users using ad blockers? Design better, leaner, more efficient and more intelligent ads. Or more likely: they're incompetent.